Wild Deers at Miyajima Island Japan. 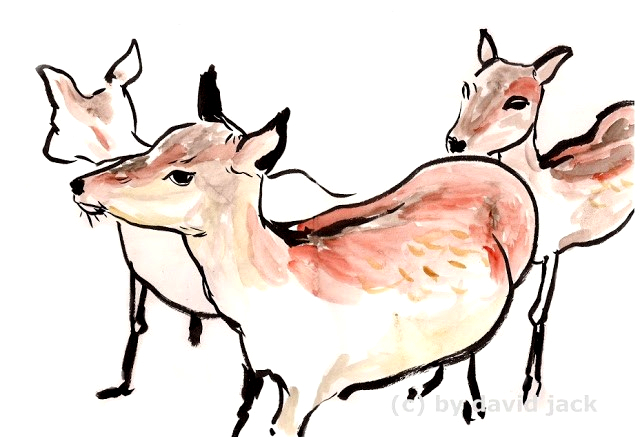 I've heard of deers in Japan before, but I never expected how friendly (and cute) they were. They loved my sketchbook (to steal the paper) so by drawing them I was attracting them to get very close. Yes, you can pet them. They still wild (so you have to expect surprises) but was something wonderfull that I won't forget. Ciervos salvajes en la Isla de Miyajima, Japon. Habia oido hablar de ciervos en Japon, pero no esperaba que fueran tan amistosos (y bonitos). Les encantaba mi cuaderno (para robarme papel), el hecho de estar dibujando los atraia muy muy cerca. Si, se dejaban acariciar. Son animales salvajes (tienes que esperar sorpresas) pero fue una experiencia que no olvidare.